Universal restore is reliable and easy solution to restore a system state (like Windows 7/8 or Windows Server 2008/2012 R2) to a computer with different hardware. "Yesterday, I went to buy a new computer because my old computer has something wrong and cannot boot. But for me, there are many important applications and data stored in the old computer and I want to continue using the old computer operating system due to its reliability and fluency. Someone suggest me to transfer or restore system state to the new computer and then I can use the original system and applications." As for a business company, if purchasing many new computers which owns different hardware, such as CPU, motherboard, memory, disk configuration, etc. But these new computers are bare machines without operating system and programs. The common thing is to deploy a same OS to these different computers without installing operating system one by one. As for computer users, you often meet system failure during using computer, especially for system crash and cannot boot. When meeting this situation, you can choose to restore a running computer system to your dead computer. In terms of scientific and technical corporations that develop software, before releasing a new product, they need test on some different computers no matter they are virtual machines or physical machines. Therefore, doing real-to-virtual and virtual-to-real computer system migration is really necessary. As to the mentioned conditions when encountering, how will you do? You can use "Universal Restore" function of AOMEI Backupper to restore system backup image to dissimilar hardware to solve the above problems, no matter the system you wish to restore is Windows 10/8/8.1/7/XP/Vista or Windows Server 2008/2008 R2/2003/2012/2012 R2. 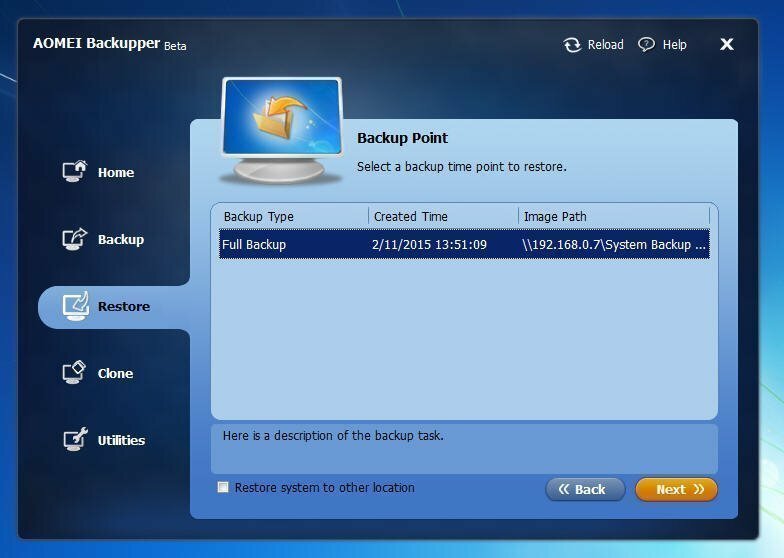 Firstly you should install AOMEI Backupper on your old computer and use this tool to create a system backup image. As to the above situations that computer cannot boot, you should boot computer by creating a bootable disc with AOMEI Backupper. Step 1. Boot your new or dead computer with bootable disc you created in advance. 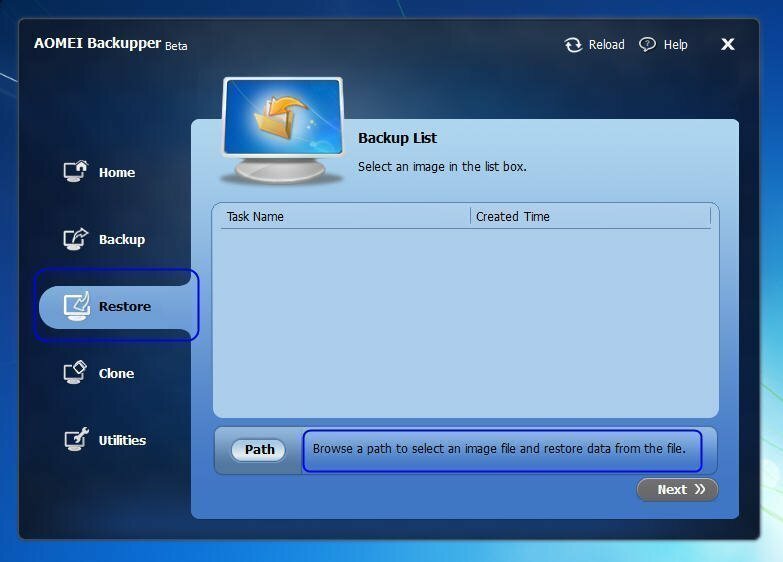 After AOMEI Backupper pops up, click "Restore" tab and find the system backup image file you have created by click "Path". Step 2. Here the system backup image file is saved on the network. Then select one backup time point to restore, and click "Next" to continue. Step 3. It is time to select a destination location where you will restore system backup image. And then click "Next". Step 4. Next in the below screenshot you will find the operation summary. If hardware of the computer you want to restore is different from the computer on which you create the system backup image, the "Universal Restore" option will be ticked automatically. If the destination location is a SSD, you can tick "Align partition to optimize for SSD". At last, click "Start Restore". In conclusion, please restore system state to different hardware according to the steps and then you can solve your problems effectively in a short time. For multiple computers, if you want to boot them at the same time, you’d better use PXE boot tool, also a bootable disc can be used but it only supports to boot one computer every time so it is a little time-consuming. Download AOMEI Backupper to do system restore to different hardware.